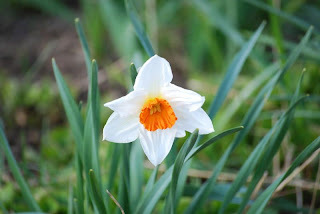 Upper Valley Connections: Think Spring! As much as we are ready to be outside playing in the mud and exploring the signs of spring, we know winter is not yet over and the forecast for Friday is shaping up to be another snowy day. Here are some ideas to help keep the kids busy and get you through the wintry day and think about spring. After all, it will be April 1st! Plant seeds for the garden, this is a great activity for kids to help out with, every child loves to dig in the dirt! Plant some grass in a pot, bucket or even a plastic lined Easter basket and watch it grow over the next couple of weeks. Do some spring finger painting, little fingertips make cute flower petals! Prepare for Easter--I came across an idea the other day to make your own paper shred for baskets by having your child paint with watercolors and then cut or shred the paper into strips to add to their Easter baskets. Make your own Easter or spring decorations to decorate your home with whatever you have on hand for supplies. Thinking spring lambs? Use cotton balls to construct or decorate a lamb. If the kids can't make mud pies outside, have them help whip one up inside with chocolate pudding for a special weekend dessert to welcome spring!